For a third day this week, U.S. Customs and Border Protection dropped off migrants from a McAllen Border Patrol processing center at the Good Neighbor Settlement House and the downtown Brownsville bus station. 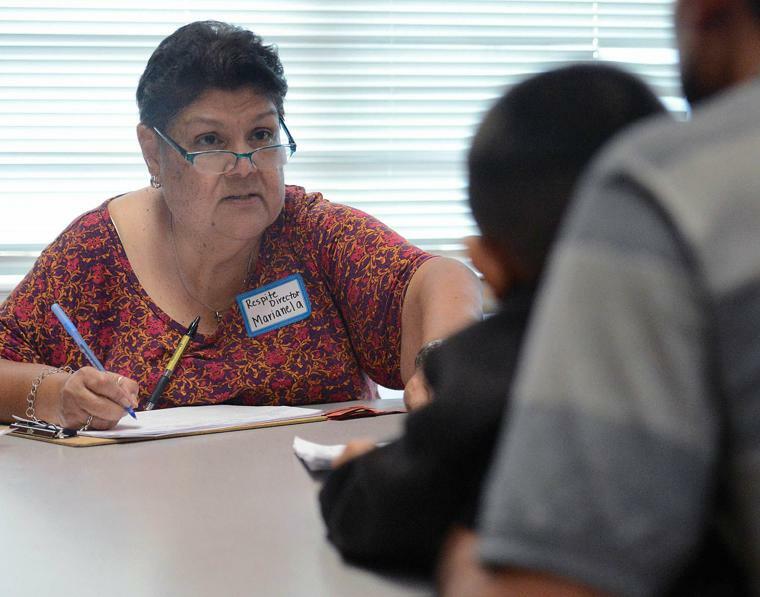 On Thursday morning, volunteers and Good Neighbor Settlement House staff interviewed scores of mothers, some of whom had dazed looks on their faces, and children, teenagers and men dropped off by CBP earlier in the morning. Migrants stood in line for a shower and were fed while American Civil Liberties Union of Texas staff also interviewed the migrants and Brownsville city employees let them use cellphones to contact loved ones within the United States. On Tuesday, CBP began releasing migrants from processing centers to the Good Neighbor Settlement House with a group of 60 at around 7 a.m. without any notice to the nonprofit, said Executive Director Jack White. The following day, White said CBP dropped off migrants in three busloads at 7 a.m., 9 a.m. and noon. On Thursday, CBP told White it would drop off three more busloads at the same time. However, the third busload of migrants scheduled for noon was instead dropped off at the downtown bus station. Each bus, White said, carries approximately 47 migrants for an approximate 240 migrants being bused in by CBP over the last three days, not including migrants from the Port Isabel Detention Center who Immigration and Customs Enforcement drops off at the bus station after they post bond. Those comments followed remarks by CBP Commissioner Kevin McAleenan who said the agency arrived at a “breaking point” and faces “an unprecedented humanitarian crisis” along the southwest border. Since last October, the start of the 2019 fiscal year, CBP has detained 136,150 family units—the same group being released by Border Patrol to the Good Neighbor Settlement House. The numbers of family units arriving at the border in February rose more than 200 percent compared to that same month in 2018, with 18,788 being detained in February 2018 compared to 58,032 being detained last month, according to CBP statistics. The Rio Grande Valley Sector accounted for 14,448 family units being detained by CBP. City Spokeswoman Christina Garza said that CBP did notify city staff that it would be releasing migrants into the city. “The city was contacted by CBP so we could adequately prepare for the increase number of travelers,” Garza said. Among those traveling migrants is a woman who only gave the name Julia, who is from Honduras and said she left her country because of conditions created by the government. She was arrested with her 14-year-old son at the border on Monday and was released at the bus station Thursday morning. She said she paid smugglers $12,000 to cross and hopes to join her sister, who arrived in the country a year ago, in Tennessee. Speaking to reporters, Julia said she thought the U.S. was a land of opportunity, but said it’s only been a nightmare since she crossed. After first being detained, she said Border Patrol put her in the “hielera,” or ice box, where the air conditioner is cranked up before dropping her off at the bus station Thursday. Julia also said she told CBP she planned to go to Tennessee but they ordered her to show up at immigration court in New Orleans, despite her objections, which has her feeling like authorities are trying to trick her. When Julia arrived at the bus station, she had no plans or phone or any way to contact family, but volunteers directed her to the Good Neighbor Settlement House. That’s where the Good Neighbor Settlement House staff, volunteers and Brownsville city employees stepped in for Julia and scores of other migrants finding themselves on the streets of Texas’ southernmost city. When the migrants arrive, they line up outside of the nonprofit and are brought in groups into the nonprofit’s auditorium where they are first interviewed to figure who they are and where they need to go. After that, the migrants are fed while volunteers hand out bags of toiletries and get them clean clothes while they wait for their name to be called for a chance to use a cellphone provided by the city to call family. The migrants are also given an opportunity to shower and clean up. White said the average stay for the migrants is six to nine hours before they are on their way to destinations across the United States. Before they leave, volunteers give them a map of the interior of the United States and a backpack with food for the three to four day trip. “The system keeps people from staying longer than a day,” White said. While going through the assembly line-like process at Good Neighbor Settlement House, ACLU of Texas staff interviewed the migrants. And while Border Patrol and CBP officials have said the increase in migrants has pushed them to a breaking point forcing the agency to release immigrants to nonprofits like the Good Neighbor Settlement House, chaos is not the word to describe the model of efficiency volunteers deployed to quickly process the people. Christina Patiño Houle, Network Weaver for the Rio Grande Valley Equal Voice Network, said the community has responded to and can handle the increased releases. Garza, the city spokeswoman, echoed that sentiment, crediting the nonprofits and community for their work in assisting the migrants.